This entry was posted on Thursday, November 1st, 2018 by Frances Ryan. 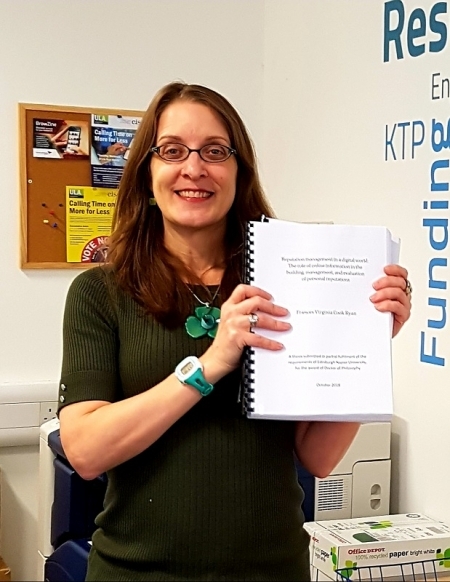 Of course, submitting the thesis is not the end of the journey and there are still a few more steps until I am awarded my PhD. The first of these steps is my viva, which is an oral examination of my thesis. After that, I will be given corrections to make to the document followed by a re-submission of the final, hard-bound thesis. Only after that can I officially graduate. But I’ll bore you with all of that stuff later. For now, I just want to talk about finally submitting my thesis for examination! Or, more importantly, I want to talk about my life post-submission. The closer I got to this big milestone, the more all-consuming it became. Even though I wasn’t working on my thesis every moment of every day over these past two months, I was pretty much thinking about working on it. And I was so overwhelmed with the amount of work to accomplish that I found myself unable to relax or to do anything that wasn’t related to my PhD. Of course, that really just means that I would sit in front of my computer at times—unable to do any PhDing, but unable to unwind enough to do non-PhD stuff. But now I find myself with a bit of free time. Free time that I will spend catching up on all of the fun and adventure I have missed out on over the past couple of months. What does that mean for you? It means I will be posting a bit more often. (An easy promise, after a two-month hiatus!) It means that I will be sharing stories about walks I have planned and even a few public talks I hope to attend. And it means that I will be catching up on a few of the “musings” blog posts that I have half-written. What does this mean for me? Well, it means that I get to enjoy all of the things I just talked about. But it also means that I can relax guilt-free for the first time in a long time. It means that I can catch up on my sleep. And on my letter writing. And on my me-time. And that is really something to celebrate! In the meantime, keep your eyes out for some fun and exciting adventure posts.